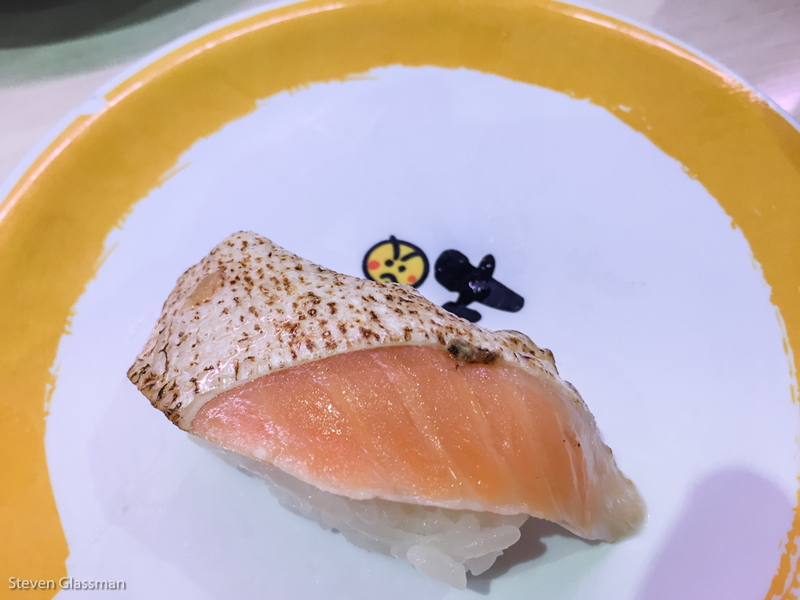 genki sushi – Sunshine. Whimsy. Tacos. 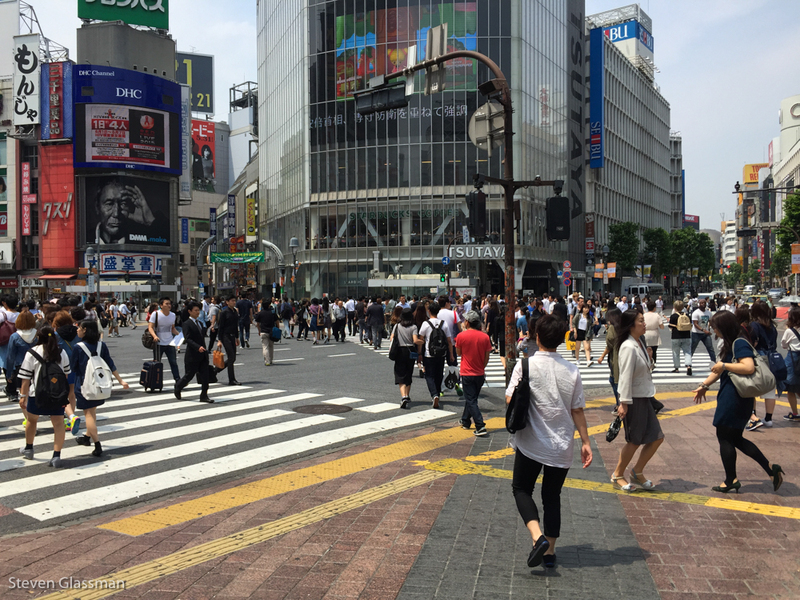 Most people know Shibuya mostly from images of Shibuya Crossing in movies and tv shows. I’ll get to that in a minute. 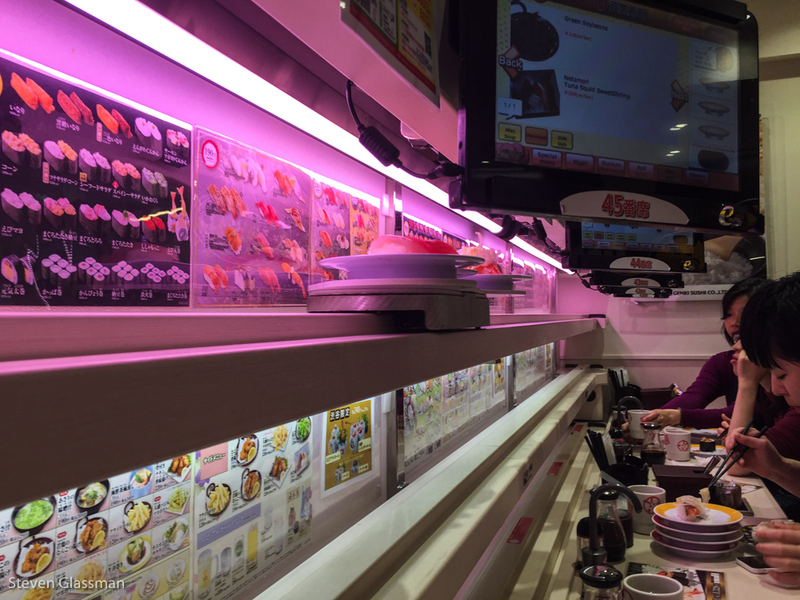 First, I wanted to talk about Genki Sushi. It’s a chain with several locations in the city, including this location in Shibuya. 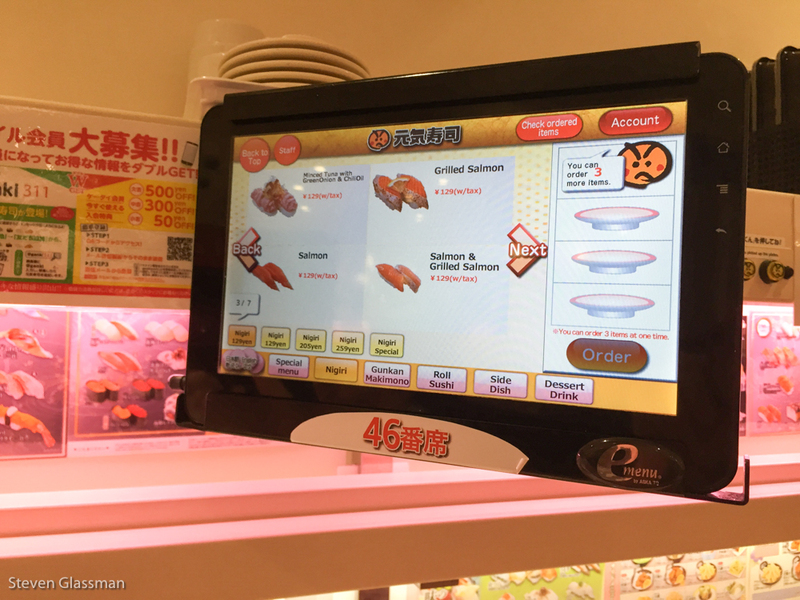 Genki is essentially a self-serve sushi restaurant. 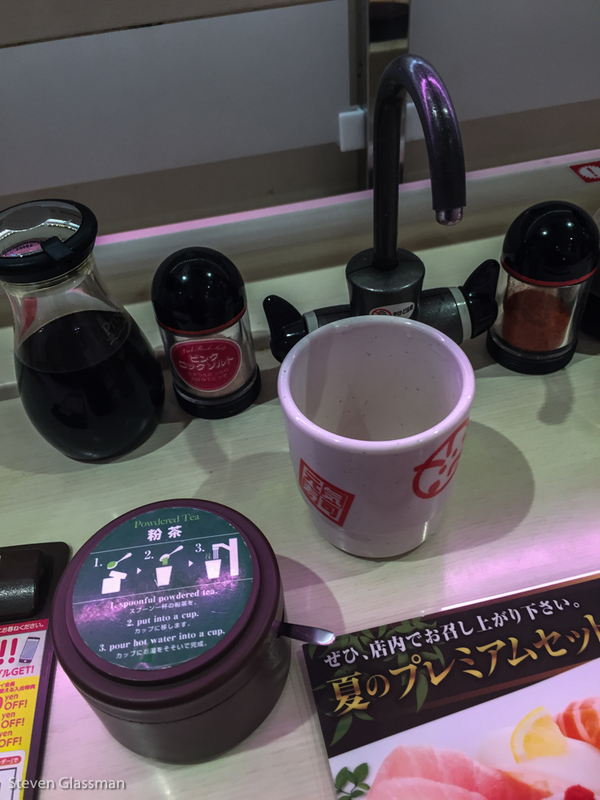 For example, each seat contains a bin of green tea powder and a hot water tap for mix-it-yourself tea. The ordering is done on a touch-screen. When you place the order, it is prepared and sent out to you within a few minutes. 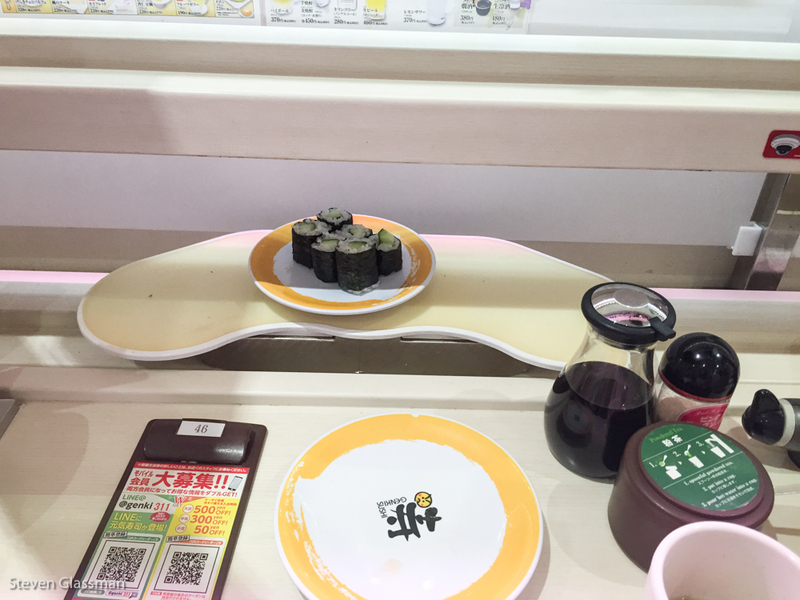 The sushi arrives automatically on these little trays. The whole mechanism is reminiscent of the rollercoaster restaurant I went to in Nürnberg. 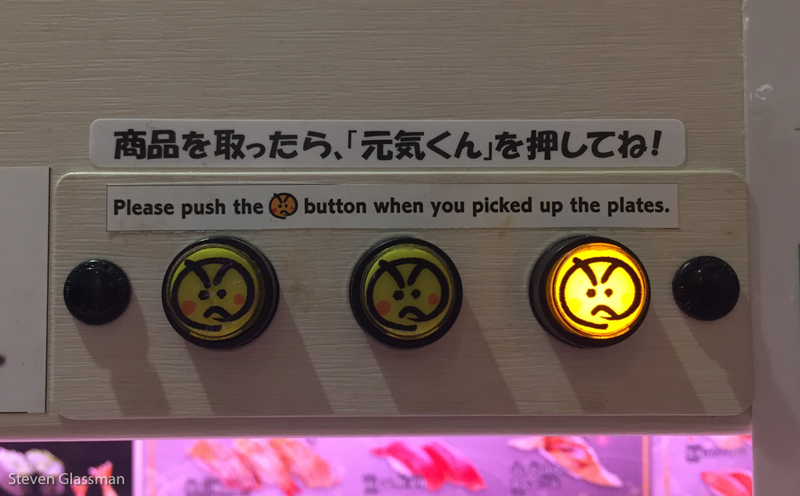 Once you have retrieved your food, you must press the lit up button to send the little automatic tray back to the kitchen. There were moments where the food caused me confusion or amusement. 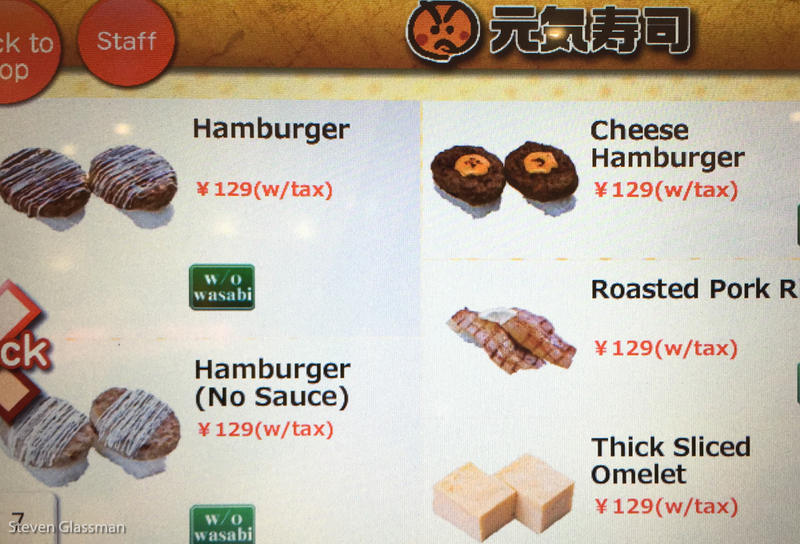 For example, their idea of a hamburger or cheeseburger is not at all in line with what I think of. 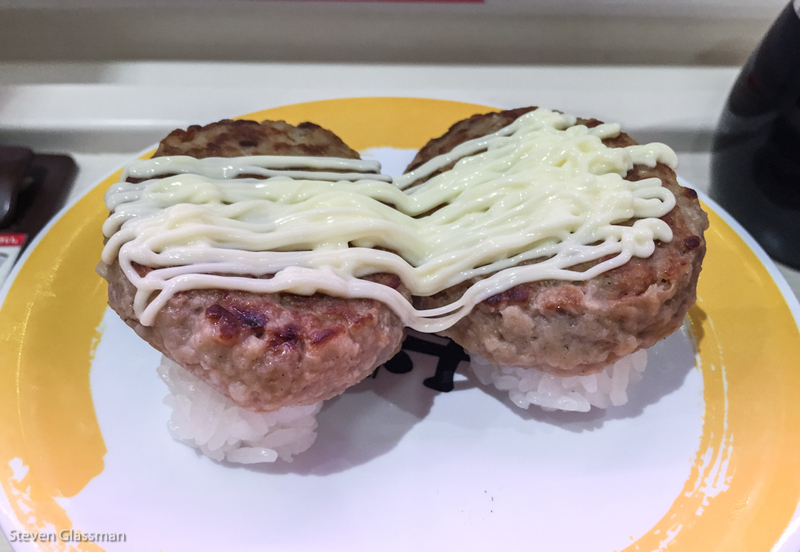 Seriously, this is a “hamburger.” It was a tiny patty of ground meat resting on a bed of rice, with a sauce on top which I believe was mayonnaise. 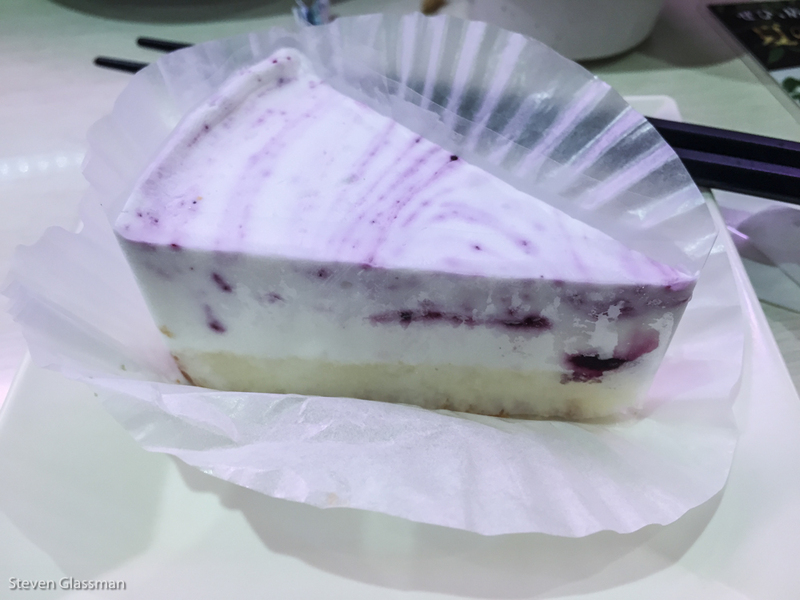 I didn’t figure out what they meant by “Semi Fred” for days after this meal, but it looked like blueberry cheesecake, so I gave it a try. 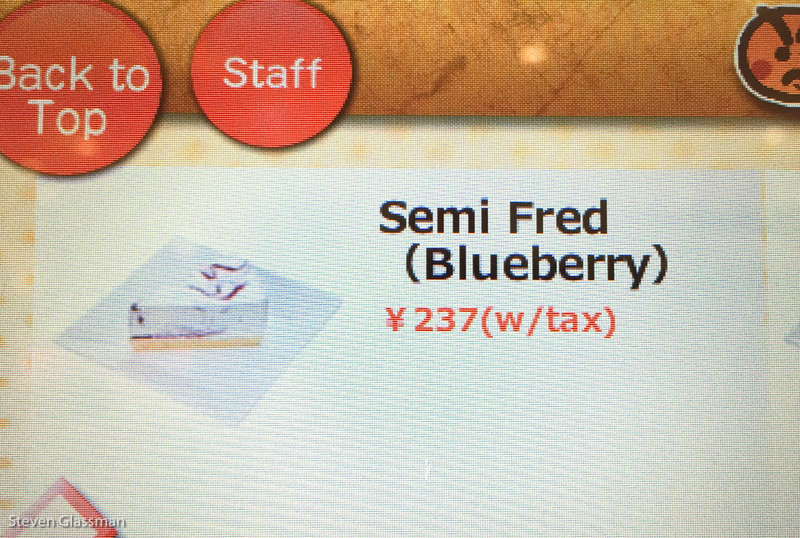 I had never heard of “Semifreddo” before this trip. The Blueberry Semi Fred was delicious, as it happens. I think that’s enough talk about food. 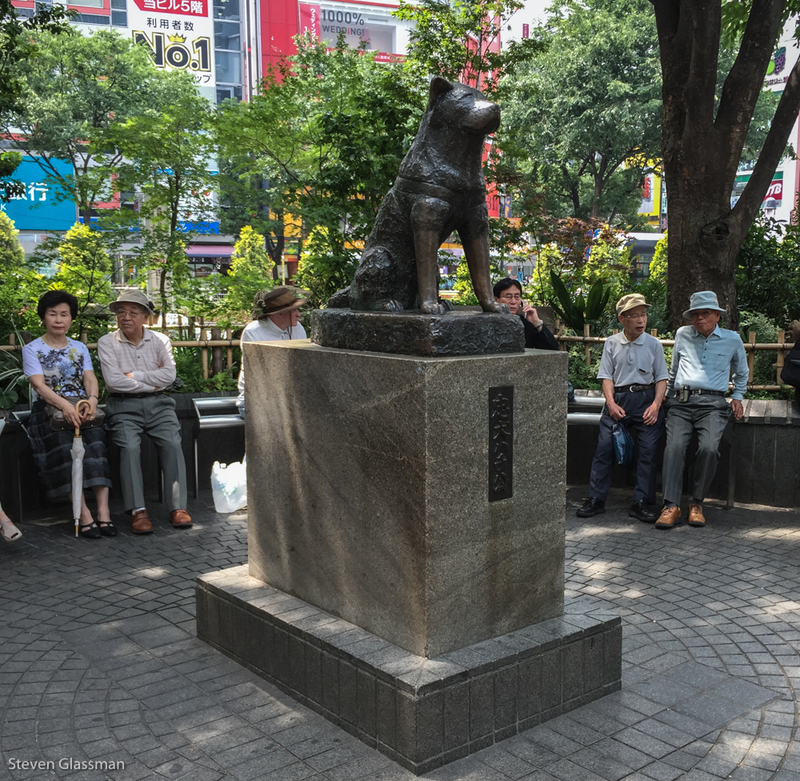 Let’s turn our attention to one of Shibuya’s most famous residents, Hachiko. 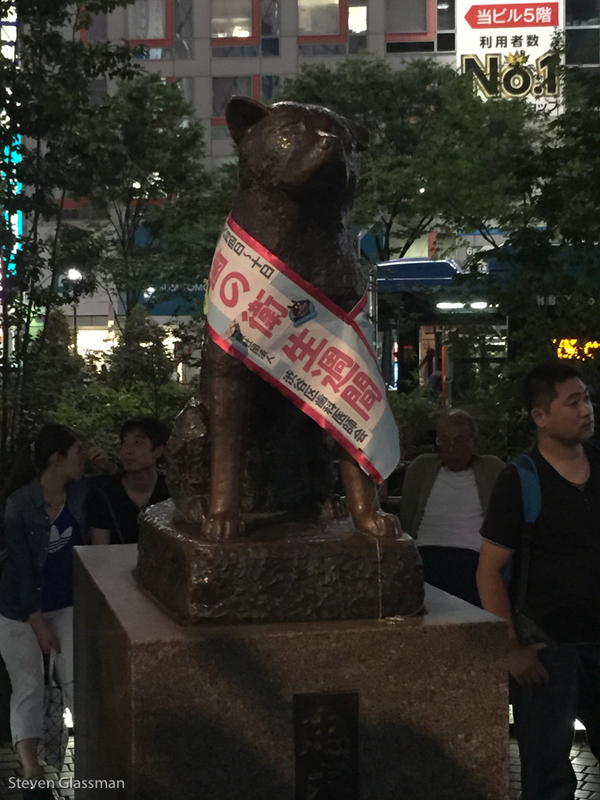 Hachiko was an Akita dog who was adopted by a professor, Hidesaburō Ueno, in 1924. The professor walked with Hachiko to the train station every day before going to his job at the University of Tokyo. The dog waited at the station for his return at the end of each day. Professor Ueno died of a cerebral hemorrhage in 1925 while giving a lecture, and Hachiko continued to walk to the station each morning. He stayed at the station waiting for his Professor every day, until his death nine years later in 1935. Hachiko was immortalized in bronze, and the first of several statues was unveiled in 1934, with Hachiko himself present. The original statue was recycled during World War II for the war effort, and a new statue was placed in August of 1948. That statue is the one which still stands at Shibuya station today. Hachiko’s story has been featured in several movies, including an English version called “Hachi: A Dog’s Tale” with Richard Gere as the professor. The Hachiko statue at Shibuya Station is also in front of Shibuya Crossing, one of the busiest pedestrian intersections in the world. This is what’s known as a “scramble crossing.” When the light changes here, it’s red lights in every direction for vehicles. Once the light is red, pedestrians cross from every direction, including diagonals. None of my pictures capture the crowd properly, because I was there on a pretty quiet weeknight. 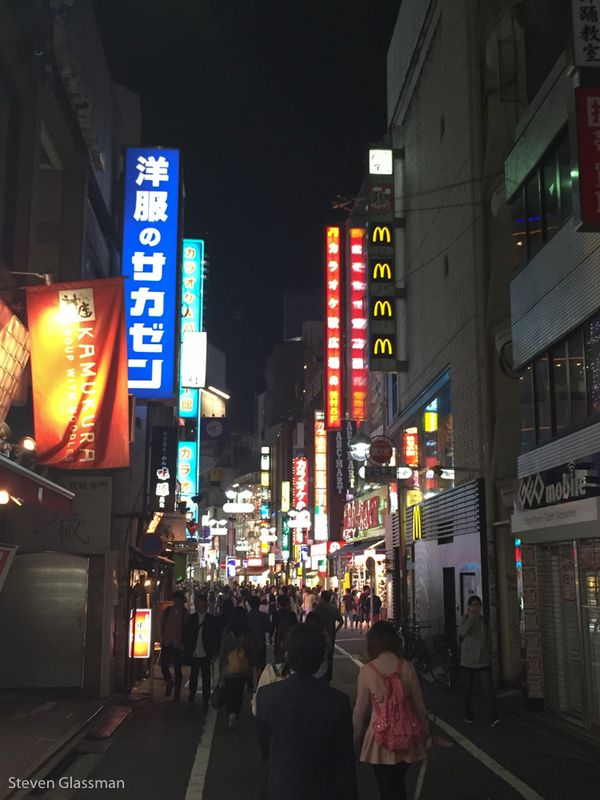 You can see this intersection in countless television shows and movies, including Lost In Translation. This Starbucks overlooks the Crossing. 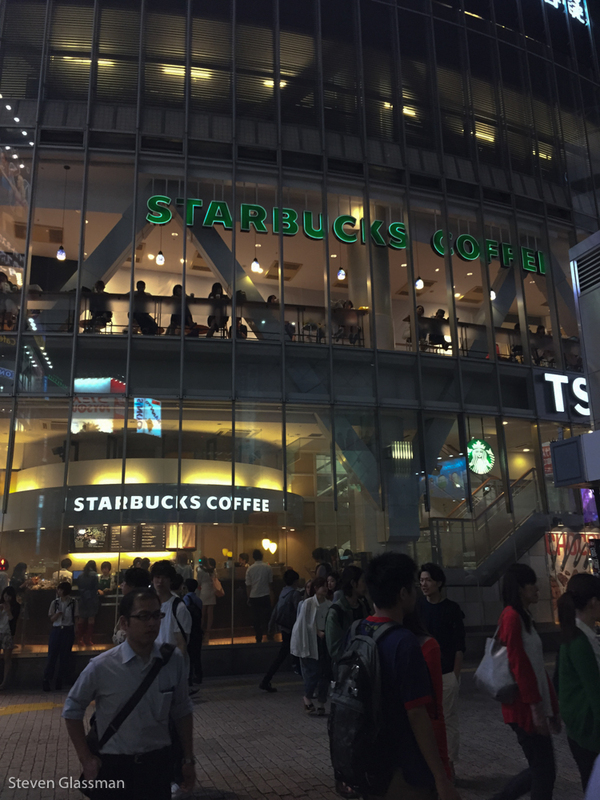 It is reportedly one of the busiest Starbucks in the world. It’s supposed to have an amazing view of the Crossing, but I never had a chance to go up there. Once you’ve crossed the street from the station, this part of the city is filled with shops and restaurants. This is where Genki Sushi is located. 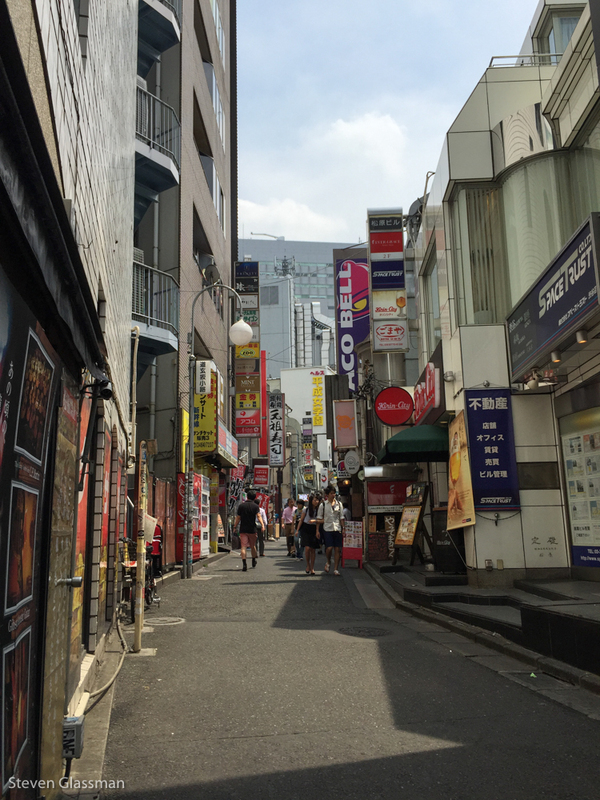 This part of Shibuya is also home to Tokyo’s only Taco Bell, as far as I know. I tried to go here once out of sheer curiosity, but I didn’t succeed- there was a thirty minute wait for food and I had to go to work. 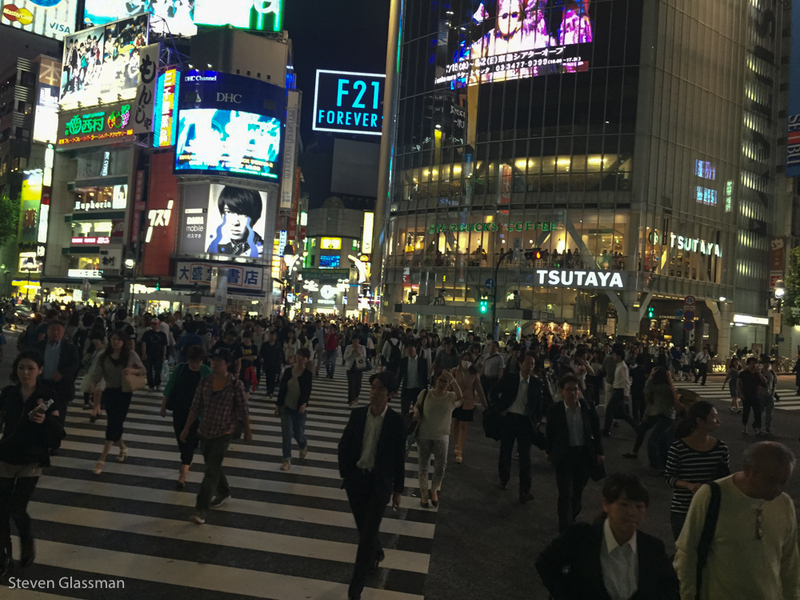 Have you ever seen a movie about Hachiko or a film with Shibuya Crossing featured?